This is a photograph of Virgil "Zeke" Barnes, of Jackson County, with an automobile. The individuals inside the auto are not identified. Barnes was a right-handed pitcher who played seven complete seasons at the major league level, primarily for the New York Giants. He had 61 major league wins, with a career ERA of 3.66; his best year was 1924, when he had an ERA of 3.06 and a record of 16-10. Barnes made World Series appearances in 1923 and 1924, including the starting assignment in Game 7 of the 1924 World Series. Virgil Barnes was born in Ontario, Kansas in 1897 and was raised in the nearby community of Circleville. He married Della Barnes, also of Jackson County, in 1920. The couple made their off-season home in rural Jackson County. In the mid-1930s, Virgil, Della and their two children, James and June, moved to Wichita. Barnes lived in Wichita until his death in 1958. This photo probably was taken in Topeka. A stamped imprint on the reverse identifies the photographer as Harold B. Wolfe, 631 Jackson, Topeka. 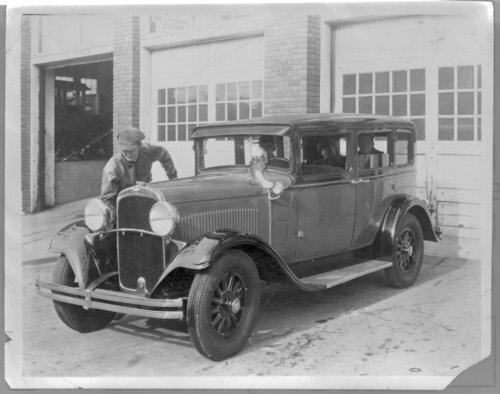 This is a photograph of Virgil "Zeke" Barnes, of Jackson County, with an automobile. The individuals inside the auto are not identified. Barnes was a right-handed pitcher who played seven complete seasons at the major league level, primarily for the New York Giants. He had 61 major league wins, with a career ERA of 3.66; his best year was 1924, when he had an ERA of 3.06 and a record of 16-10. Barnes made World Series appearances in 1923 and 1924, including the starting assignment in Game 7 of the 1924 World Series. Virgil Barnes was born in Ontario, Kansas in 1897 and was raised in the nearby community of Circleville. He married Della Barnes, also of Jackson County, in 1920. The couple made their off-season home in rural Jackson County. In the mid-1930s, Virgil, Della and their two children, James and June, moved to Wichita. Barnes lived in Wichita until his death in 1958. This photo probably was taken in Topeka. A stamped imprint on the reverse identifies the photographer as Harold B. Wolfe, 631 Jackson, Topeka.